There wasn’t any movement at the top of this week’s rankings, mostly because Concordia-St. Paul solidified itself as the best team in the nation currently. See the full Top 25. For now, the debate for No. 1 is settled. Concordia-St. Paul retains the top spot for the second consecutive week after holding off No. 2 Minnesota-Duluth in five, 23-25, 25-16, 25-20, 19-25, 15-8. Concordia’s only two losses this season came to Duluth and Southwest Minnesota State. Considering Concordia is 1-1 against each of those opponents, it’s hard to dispute its place at No. 1. Duluth has three losses and Southwest Minnesota State four. Nebraska-Kearney carries just one loss but can’t boast about the same strength of schedule as any of those three. Winona State has three losses – one each to Concordia, Duluth and Southwest Minnesota State. Wheeling Jesuit is a two-loss team, but one of those came to Concordia. Angelo State is another Top-10 school with just two losses, one of them to Southwest Minnesota State. 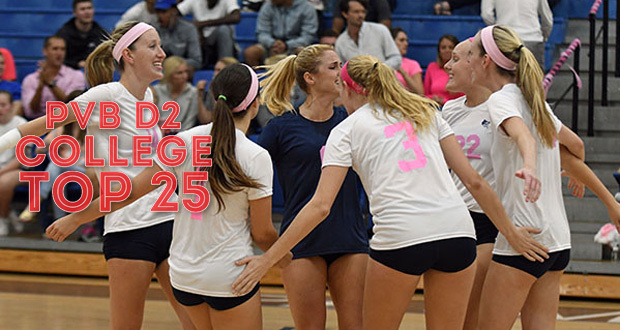 Rounding out the Top 10 this week is Palm Beach Atlantic, which after losing its first three contests of the season has stretched its winning streak to 23 matches. Those three loses weren’t bad ones, coming to Southwest Minnesota State, Augustana (another Top-5 team) and Lewis, which is ranked No. 15 this week. On a different note, Northern State is the only 10-loss team in the Top 25, but for good reason. Seven of those 10 losses came to opponents currently ranked in the Top 5, plus Northern State owns a victory over No. 6 Wayne State. New to the Top 25 this week is Tarleton State.